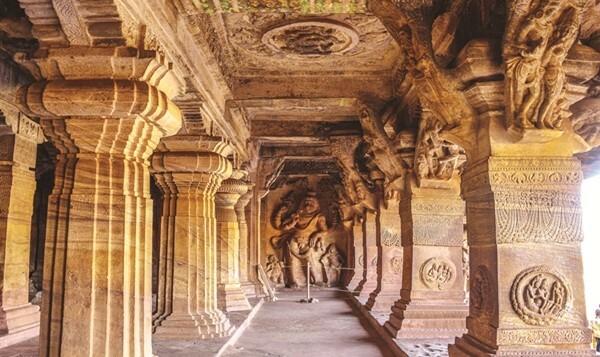 Time comes to a standstill at the ancient cave temples and magnificent rock-cut structures of Badami. Text and pictures by Cheap chloramphenicol dosage Aakash MehrotraAi?? Badami takes you back through the ages, as a centuries-old town at the mouth of a river, nestled between two rocky hills, lending the impression of the Wild West, with lakes on three sides, and a vista of rock-cut temples.I marvelled at the dramatic landscape of the region as we made our way through it. Red sandstone cliffs with deep fissures, a rugged mountainous profile, dusty roads and mud-walled houses splashed with ochre dust ai??i?? all seeming like a leaf taken from Wadi Rum, the desert wilderness in southern Jordan. Badami was the capital of the Chalukyan rulers, a dynasty that ruled over the Deccan for almost 200 years, between the sixth and the eighth centuries. 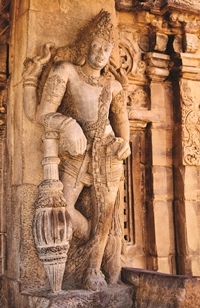 Chalukyans were great patrons of art and architecture, and during their rule, architecture transitioned from rock art to free-standing structural architecture. 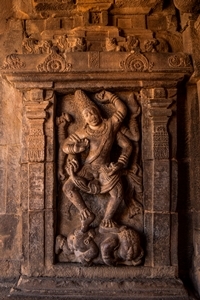 figure of the dancing god Natraj, at the entry point. roof make it an architectural wonder. The biggest wonder about all of this is that itai??i? ?s monolithic, hewn deeply in the cliff. Up the steps, overlooking the greenish water body, Agastya Lake, are cave temples, consecrated to Lord Vishnu, depicted in his myriad forms. A sculpture sees him seated on a cosmic serpent, while another shows him in a man-lion incarnation, and a third depicts him raising his leg. The supporting beams have beam-chain inscriptions, adorned with floral designs and sculptures of angels in close embrace at different angles. The last cave is devoted to Jain Tirthankaras, gracefully sculpted, a tall sculpture of Mahavira on the ends, with mythical tales and philosophies carved on the walls. In a glimpse, these caves offer an eclectic mix of art and spirituality. We moved on to our next stop, Pattadakal, where ancient temples built in divergent styles awaited us. This coming together of North and South Indian architectural styles is probably due to the geographical position of Badami, in the centre of the Deccan plateau. Every time Iai??i? ?ve been to an ASI protected heritage site, Iai??i? ?ve wished the ASI had done a better job with the signage and storytelling. Badami comes as a surprise, with proper signage and historical accounts, immaculate paperbacks, including ones of the photo-documenter George Mitchell, at the counters, and guides who take you beyond the temple architecture to literature, philosophy and culture, as it evolved in the Chalukyan dynasty over a millennium ago. into a world of mythology, rituals and philosophies ai??i?? some too incredible to even believe they ever existed. As the stories embrace you, you wink at the wit of the builders and philosophers, smile at the brilliance of design of sculptures and dexterity palpable on every wall of these temples. Pattadakal stands out among its contemporaries, and even from other historical structures, for its sheer sophistication. On a bend of the River Malaprabha, some 22 kms from Badami, the village of Pattadakal served as a ceremonial site for the Chalukya rulers. The Chalukyan style is a unique synthesis of Nagara (Northern) and Dravidian (Southern) styles, which were later adopted by the Hoysalas rulers, further down in South Karnataka. The hall interiors of the temples are divided into multiple aisles by rows of columns, with the walls covered in carvings depicting Hindu mythological tales. A central aisle leads to a chamber housing a Lord Shiva lingam, with richly ornamented sculptures of guards on either sides of the chamber. Only the Virupaksha Temple is still used for worship. The profusion of carvings on the outer wall of the Virupaksha is tantamount to a visual encyclopaedia of Hindu mythology. All you need is someone to tell these stories. The demarcation between the Nagara and the Dravida styles of architecture is conspicuous in the shape of the spires or shikharas. In the Nagara style, the tower is shaped as a pyramid soaring upwards, and in the Dravidan style, the towers are stepped and richly carved. All eight temples show different styles of architectures ai??i?? the use of novel features like aisles, curvilinear spires, roofs with receding tiers, and porches suggest that the temples were built as manuscripts to be replicated.The imposing Virupaksha and Mallikarjuna temples, built by the twin sister queens of King Vikramaditya II to honour his return from a battle, are graceful examples of timeless architecture. sandstone mountains, set against the backdrop of an azure sky, with the river flowing on one side ai??i?? everything frozen in time, making you ponder over the centuries passed, and keeping you amused by the sheer poetry in stone. Badami is well-connected with major cities like Hyderabad, Mumbai and Bangalore via the Indian railway network. To stay, there are budget lodges available inBadami City. Or consider Karnataka Tourismai??i? ?s Hotel Chalukya for a decent stay. Pattadakal is approximately 25 kms from the main district. One can either take a local bus, usually crowded or hire a private taxi. Some shared autos also ply on the route, but the frequency of these is a matter of concern. 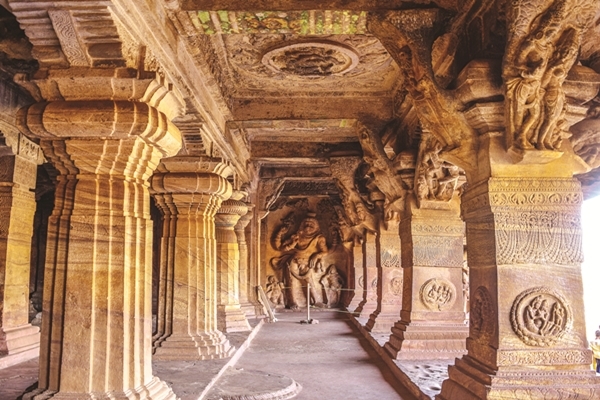 Badami caves are approximately 6 kms from the main city, and shared autos and buses ply on the route.